Amazing news – Tesco have decided to offer it’s online shopping API to developers to develop what they will with their database and their product inventory. In a very forward thinking, future-gazing move the supermarket giant are embracing Web 2.0 and opening up it’s doors to allow it’s data to be used elsewhere around the web as third parties see fit. Interestingly a few months ago now The Guardian also unveiled an API which they called Open Platform. Back then there was equal bemusement as to the use that such an API could be put, and the same can be said of today’s announcement. There will also inevitably be a lot of small print to read! Of course the whole notion of the API sits firmly within the Open Source movement, and came into the spotlight when Twitter launched, as a minute offering, with an API to allow developers to do anything they wanted to with the data. Indeed this is how Twitter rose to stardom – it’s not the geeky nature of being able to share every engrossing detail of your day, but the ability to chop up and present that data in as many ways as anyone might like to. 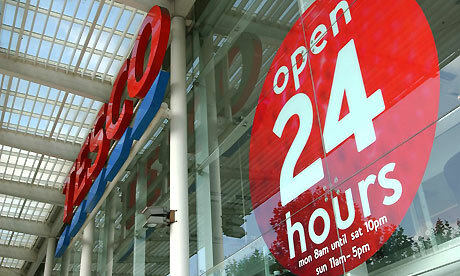 So for Tesco – well I guess a whole load widgets might come out of this. They do sell more than just groceries these days… can anyone else come up with anything off the cuff? What is the most useful thing you could do with Tesco’s database? There’s a bunch of bananas in it for the best idea!